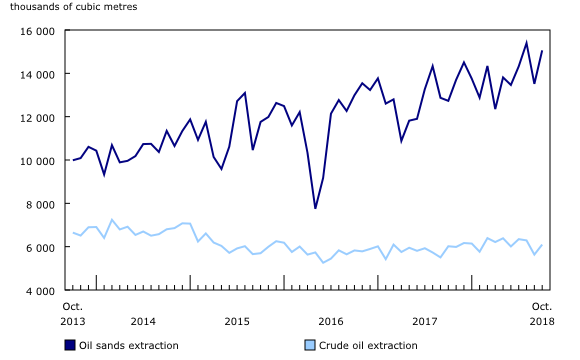 Canada produced 23.1 million cubic metres (145.6 million barrels) of crude oil and equivalent products in October, up 13.2% from the same month a year earlier. Non-upgraded crude bitumen (+15.7%) and synthetic crude (+23.2%) were the primary contributors to the overall rise in production, while light and medium crude (+5.4%) and equivalent products (+16.9%) also increased from October 2017. Production in October 2018 was augmented by the completion of maintenance at an Alberta facility. Meanwhile, heavy crude oil was down 7.1% in October. Year over year, production of heavy crude has decreased in 9 out of 10 months so far in 2018. Crude oil production (excluding equivalent products) totalled 21.2 million cubic metres in October, up 12.8% from the same month a year earlier. Oil sands extraction, which consists of non-upgraded crude bitumen and synthetic crude oil, increased 18.3% year over year to 15.1 million cubic metres. Over the same period, extraction of light, medium and heavy crude oils rose 1.3% to 6.1 million cubic metres. Alberta produced 19.3 million cubic metres of crude oil and equivalent products in October, an increase of 17.3% from the same month a year earlier. Alberta (83.2%), Saskatchewan (10.0%) and Newfoundland and Labrador (4.2%) accounted for the majority of Canadian production of crude oil and equivalent products. Exports of crude oil and equivalent products increased 10.7% from the same month a year earlier to 17.9 million cubic metres in October. Exports via pipelines to the United States rose 3.0% and accounted for 83.8% of total exports. Over the same period, exports to the United States by other means (including rail, truck, and marine) continued to increase, and accounted for 13.1% of total exports. The remaining 3.1% of exports went to countries other than the United States. 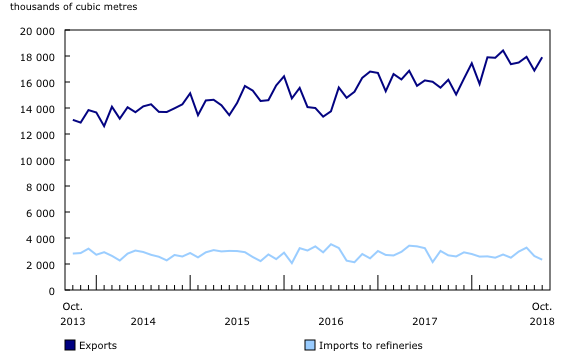 Meanwhile, imports of crude oil to Canadian refineries, which tend to be volatile, were down 12.5% to 2.3 million cubic metres. Closing inventories of crude oil and equivalent products totalled 19.1 million cubic metres in October, up 11.9% from the same month a year earlier. Closing inventories consisted of crude oil and equivalent products held by transporters (+7.4%), fields and plants (+22.2%) and refineries (+21.8%). 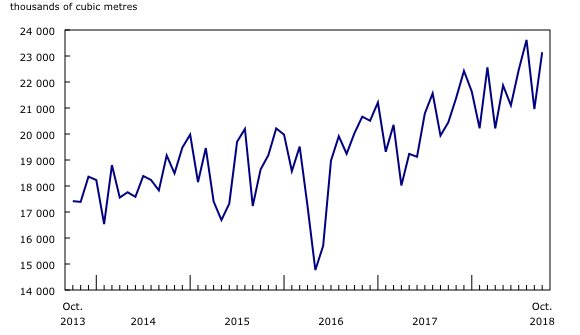 The production of marketable natural gas in Canada rose 0.9% from the same month a year earlier to 14.3 billion cubic metres in October. Production was concentrated in Alberta (70.2%) and British Columbia (27.6%). Additional information on natural gas is available in "Natural gas transmission, storage and distribution," published in The Daily on December 21, 2018. Data from September 2018 have been revised.